It’s taken me a while to get around to typing up this post about my Abel & Cole Mixed Fruit and Veg Box, the summer holidays swooped in and took me off my feet as far at the blog was concerned! Off to Norfolk for a week on the Broads last week and trying to get the kids motivated this week has been, well, it’s been challenging! You may have already read my review of the Abel & Cole Smoothie Box, something I didn’t even know they did before. That was a bit different to this review; it was more following instructions and making the smoothies…which if you know me well you’ll know this was a challenge in itself…sticking to the ‘rules’ but it was lovely and you can read more about that box here. This Mixed Fruit and Veg Box was more my style…free style! I love the fact that you don’t know what you’re getting (little side note; you can find out what you’re getting and even make substitutions but I love to be surprised, even better still, open up the box to be faced with a fruit or veg I’ve never seen before, let alone know what to do with it? Each Mixed Fruit and Veg Box is £19.95 and you can choose to have them delivered weekly or less often, you’re in control. So Sunday was the first day I got to let my creative juices flow, the box was actually delivered Friday but we had other plans for those days. I hate mushrooms; I really, really wished I didn’t. Brett loves mushrooms; he really, really wishes I did too! I buy the shopping, I don’t like mushrooms = no mushrooms! I decided to make Beef Stroganoff for dinner (wait, what?) I thought I’d give them one more try. Method: simply brown off the meat in a large frying pan, add the onions and cook until translucent. Add the paprika and be sure to scrap off all the yummy bits in the bottom of the pan, and then add the brandy. Finally pour in the cream and add the mustard and season to taste. I dished our Beef Stroganoff up with rice but it can also be served with fried potato or chips (obviously not for potato-avoiders like me!) The kids had a few mushrooms on their plates and I too took part in the activity of eating mushrooms…I managed 3! I officially do not like mushrooms. Brett on the other hand was in heaven, he had mushrooms on his mushrooms and said the dinner was a success, to be fair, the meal was delicious, I love creamy sauces, I just had to weave my way around the dish that’s all! Method: place the halved plums flat side down in the bottom of an 8” cake tin. In a small pan heat the dark brown sugar and a nob of dairy free butter gently until it melts. Pour over the arranged plums. To make the base, add all the ingredients to a bowl and mix to combine. Tip out onto the work surface and knead. The sweet pastry will be very soft. Roll out to the diameter of your cake tin (some overlap is fine as you can tuck this in down the sides) Transfer to the cake tin and cover the plums and sugar sauce. Pop in a preheated oven at Gas 200°C or 180°C for a fan oven. It’ll take about 20 mins to cook, don’t worry if the sugar syrup bubbles up around the edges. Once cooked, turn out onto a plate and serve hot. This family meal was me being crafty mum. Lewis loves spaghetti Bolognese, it’s one of the meals he could happily eat every day, that and chilli with tortillas or tacos. Lewis’ cooking day is normally Tuesday (Beth’s is Thursday) but as Lewis had had a craving for Spaghetti Bolognese all day Sunday I said he could make dinner the next day. This gave me time to be sneaky! I try to pack as many veggies into my meals as possible, the kids will eat veg but only certain kinds and I want them to have more variety, especially Beth who struggles to maintain acceptable iron levels. However it’s also important to keep Lewis’ vitamin and mineral intake up due to the fact that by the nature of his autism he avoids many foods. Method: While Lewis was in school for the morning I blitzed together the tomatoes, some chard, garlic and carrots with a cup of water. Then I added the puree, herbs and seasoning. This made more than enough hidden veg sauce for two dinners so I have frozen the second tub. Method: Lewis browned off the mince in a large frying/wok pan and added the stock pot, we always ladle off any excess fat before adding the stock pot. The onions were then added (and when Lewis’ back was turned I added the rest because he only put half the onions in!). Lewis then added the passata, garlic, herbs and seasoned. Then we let the Bolognese simmer for at least 30 mins. Lewis went off to play his Xbox and I added the hidden veg sauce. It takes a good 30 mins for the sauce to deepen in colour and cook off the raw tomato taste/smell to be fair; I’d ideally leave it for up to an hour. To serve we cooked up our favourite gluten free spaghetti. I had a real craving for chicken burgers on the Tuesday but knew I still wanted to make good use of the Mixed Fruit and Veg Box so I decided to have burgers in buns with some delicious sides…I say delicious, I can’t eat potatoes but I’m reliably informed that the potato salad I made was delicious! Method: simply boil/stream the potatoes until they give when you insert a knife. Allow to cool completely. Pop into a bowl and add the remaining ingredients, mix to coat the potatoes. Method: this is easy, just shove it all in a saucepan and let it simmer until it turns to mush, add the parsley last so it retains its green colour. This will keep in a sterilised jar for up to 10 days in a fridge. It was the perfect addition to my chicken burger in a bun! Wednesday: The cake that never happened… Upside Down Cake with flat peaches! By Wednesday our Mixed Fruit and Veg Box was still fresh but greatly decreased in quantity, I think the large box for £27.50 may suit our family more, mind you, could I maintain the hidden veg campaign for a whole week, I’m not sure? So, I was left with a small bowl of broad beans, a handful of new potatoes and half a bag of chard which all got eaten with a quickie meal Wednesday evening of gluten free shop bought pie and veggies. Well, I say all the veggies got eaten with dinner; the broad beans didn’t quite make it! 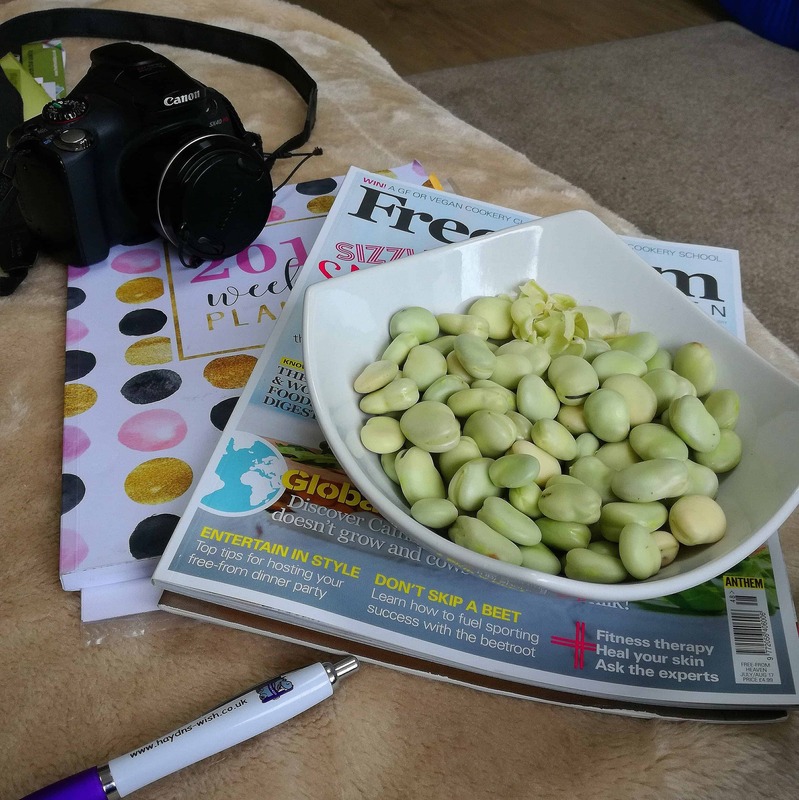 I have a thing for raw broad beans and love fiddly food so sitting in my comfy chair, blogging and catching up on my social media I may have scoffed the entire bowl! Obviously the fruit was snacked on, thanks to Lewis and he and I also ate the remaining plums after I made the Tart Tatin. So all in all we had a super healthy week and every single morsel of organic goodness was chomped before the end of Wednesday, making this Medium Mixed Fruit and Veg Box last 4 days. Like I suggested, this may be a realistic size box for a family who don’t eat copious amounts of fruit and veg, if that’s not you, and you’re thinking of trying a Mixed Fruit and Veg Box out for yourself, then maybe you’d be better off with the larger box to get you started and see how you go? Disclaimer: as mentioned, this Mixed Fruit and Veg Box and the Smoothie Box were sent to me free of charge after I approached Abel & Cole to try out their boxes in return for a review. I don’t do ‘oh-ah this is the best thing ever’ reviews, I tell you as it is, if I was in anyway dissatisfied I jolly well say so! NextEver fancied having a go at blogging yourself?